Modern Versions – King James Only? As mentioned in the previous post, original translations can utilize either dynamic equivalence (idea-for-idea translation) or a more formal equivalence (word-for-word translation). These are not hard and fast terms since even the most formal translation will sometimes translate an idea instead of the words. Even the King James version translated the Greek ?? ??????? as “God forbid” , following the Hebrew formula ?? ???? ?, rather than its literal meaning of something like “let it not be!” (The term actually seems to be the direct antonym of the Hebrew ???.) So when we are classing translations as dynamic or formal, we are really placing them on a spectrum. If you draw a horizontal line and label the two ends as formal and dynamic, you could place every English translation of the Scriptures somewhere on the line. The King James Version would be on the formal side, but not completely formal. The only completely formal translations would be those that appear in interlinear editions of the Scriptures, and these are not exactly easy to use for regular reading. More formal translations like Young’s Literal Translation are virtually indecipherable in English. On the other side of the spectrum, we have paraphrases like the Living Bible or the Message. These are entirely dynamic and will be dealt with in the next post in this series. Translations like the King James Version or the English Standard Version try to strike a balance, leaning toward formal equivalence. What we would class as dynamic translations are on the other side of the balance, leaning toward dynamic equivalence. Arthur Farstad believed that a New Testament translated from the Majority Text (not the Textus Receptus) was needed among conservative Christians. Because the ESV and other newer translations followed the ‘Critical Text’, he felt a Majority Text Bible would be widely accepted. His death, however, sent the project in another direction and instead of the MT translation Farstad envisioned, the HCSB followed newer Greek New Testament manuscripts to satisfy the demands of the SBC which was financing the project. The HCSB has chosen to use the balance and beauty of optimal equivalence for a fresh translation of God’s word that is both faithful to the words God inspired and “user friendly” to modern readers. The HCSB is certainly more formal than dynamic in its translation. It uses a form of educated English and is written on a high school level – as opposed to many dynamic translations which are written in grade school English. The HCSB is considered by some to be a ‘Baptist’ translation and erroneously thought to have been done so the Southern Baptists could use it instead of the NIV in their Sunday School curriculum. This is patently false, although the HCSB has a growing popularity among Southern Baptist Churches. To be honest, I did not know much about the origin of the Holman Christian Standard Bible (HCSB) until I began this series of articles. One of our readers mentioned some links in a comment that are worth exploring. Arguably one of the more innovative translations, the NET Bible is difficult to categorize. It features both dynamic and formal equivalence, often swapping the two between notes and text. Because of the online format, even the distinction between text and notes is blurred. The project that became the NET began in 1995 as the internet was becoming a mainstream phenomenon. The idea was to create a completely free translation of the Bible which could be made available to everyone. 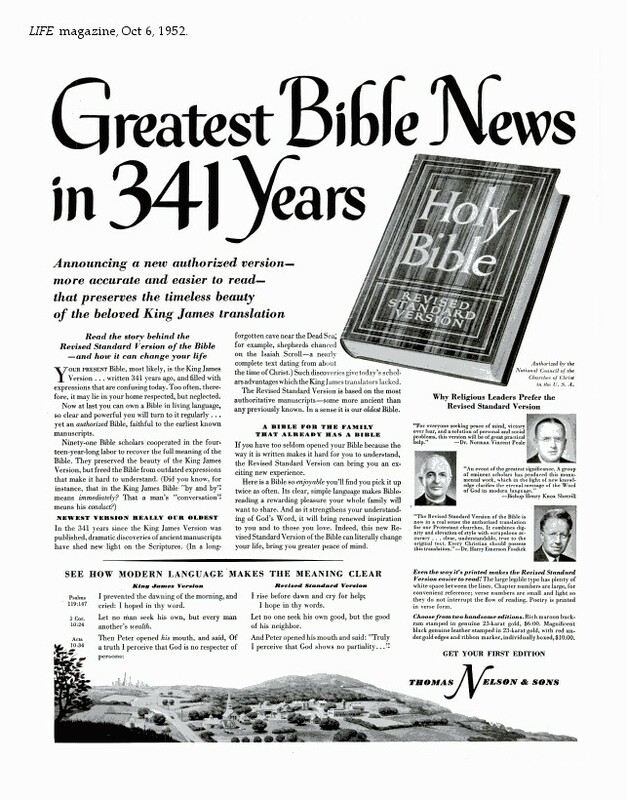 Originally, the plan was to provide the NET via CD-ROM (like those AOL disks everyone used to get in the mail EVERYDAY), but once the internet became user-friendly, the NET team purchased the http://www.bible.org and began to make the edition available online. The first edition was made available in 2005, ten years after the project began. Minor revisions have continued to be made over the past five years – which is both a positive and a negative. The unique fact that people were constantly interacting with the NET as it was translated produced an interesting effect. It is truly the first translation of its type. Currently, there are two other online Bible projects in progress – The Free Bible and The Conservative Bible Project – but neither looks to have the widespread appeal of the NET Bible. Begun in the 1990’s, the International Standard Bible currently consists of a New Testament only. It is expected that the Old Testament will be completed sometime in the next couple of years. Like the NET Bible, the ISV is an online project. It is published only electronically and while not strictly open-source, it is made available through most major Bible software packages. As you can see, there seems to be a trend away from the printed Bible in the world of ‘formal’ equivalence. There are a few reasons for this, not the least of which is that if someone wants a formal translation those in the tradition of the KJV continue to be the best. Another important reason is the financial risk. Christian printing houses must finance a printed Bible translation – a project that requires quite a bit of funding and effort, not to mention financial risk. Imagine the cost of employing thirty world-class scholars for the better part of a decade. At even a modest $75,000 per year per scholar over a five year period, the bill would be around $11.25 million, and that is just salaries for the translators! Printing costs, advertisement, distribution – the overhead for such a project must be enormous. Printing houses are increasingly reluctant to do this when what will be produced will still be markedly similar to something that already exists and is widely available. It is far easier to assemble revision committees or to adopt the work of individuals. Recovering the cost of such a massive project would take years. Even if the average profit on a printed Bible is $15, the printer would have to sell 750,000 copies just to recoup five years of direct loss in salaries to the translators. In our next article, we will explore the ‘paraphrase’ translations which have become increasingly popular – namely, the Living Bible and its daughter the New Living Translation and Eugene Petersen’s The Message.